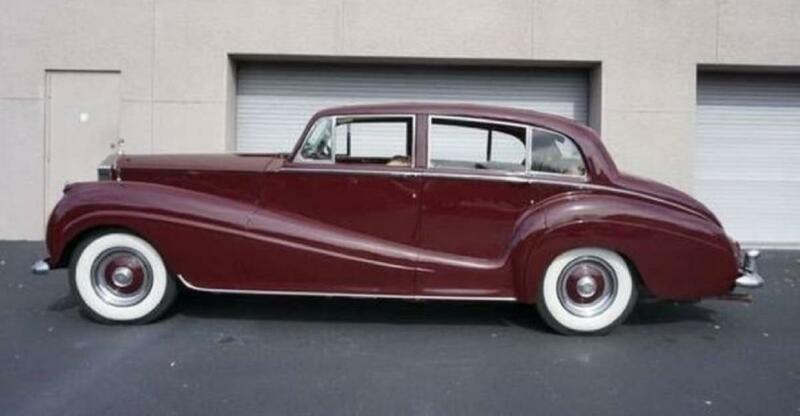 This stately famous DT Rolls-Royce car deserves besides the 551 his own attention in this forum. The Honourable Charles Stewart Rolls (27 August 1877 – 12 July 1910) was a Welsh motoring and aviation pioneer. With Henry Royce, he co-founded the Rolls-Royce car manufacturing firm. He was the first Briton to be killed in an aeronautical accident with a powered aircraft, when the tail of his Wright Flyer broke off during a flying display in Bournemouth. He was aged 32. Sir Frederick Henry Royce, 1st Baronet, OBE (27 March 1863 – 22 April 1933) was an English engineer and car designer who, with Charles Rolls and Claude Johnson, founded the Rolls-Royce company. 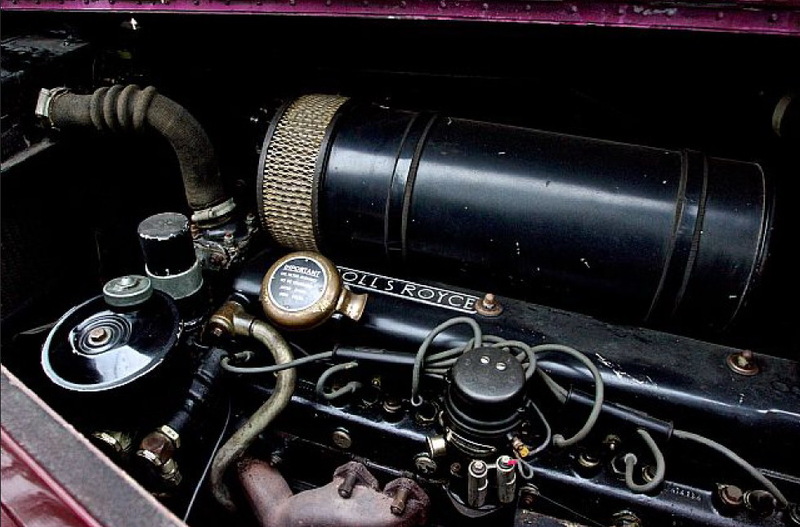 Rolls-Royce was founded in 1906, when car dealer Charles Rolls and engineer Henry Royce started working together. They wanted to build the best car in the world, with the best technology and the highest quality. They did that too, with the Silver Ghost that was built almost 8,000 times from 1907 to 1925. Rolls-Royce took over Bentley in 1931 and from the Second World War onwards, Bentleys and Rolls-Royces often had strong similarities. In the 1960s, Rolls-Royce introduced the Silver Shadow, which was produced in series, which appealed to a younger audience of artists and artists who demonstrated their success with their cars. Rolls-Royce went bankrupt in 1971 due to the enormous costs for the development of aircraft engines. The car division was split off and nationalized in 1973. 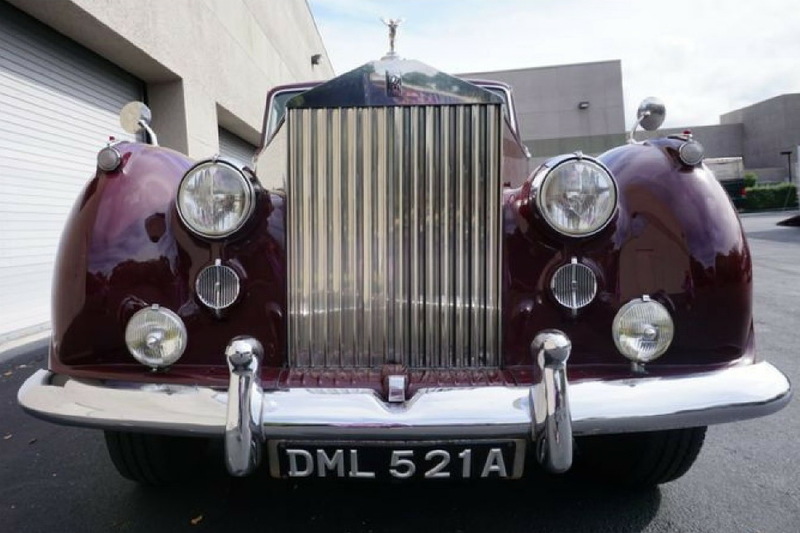 In 1980, the car manufacturer as Rolls-Royce Motors was taken over by defence company Vickers, which continued to produce Rolls-Royce and Bentley alongside each other. Since 1998, Rolls-Royce Motor Cars has been the sole property of BMW, after lengthy haggling with Volkswagen, which had taken over Rolls-Royce and Bentley from Vickers. However, that deal did not include the use of the logo on cars, which is still used by aircraft engine manufacturer Rolls-Royce plc. used to be. He sold the rights to use the logo to BMW, which already supplied engines to Rolls-Royce. BMW continued to deliver engines until the end of 2002. After a year, however, BMW was able to get rid of the motorcycle deal, so that Volkswagen no longer saw any benefit in preserving the rights to build Rolls-Royce cars. It therefore sold Rolls-Royce to BMW and retained Bentley. Rolls-Royce has been fully owned by BMW since 2003. The Rolls-Royce emblem is of course the well-known RR logo. Rolls Royce badge was coloured with red in the beginning years of the company, but it was changed to black in 1934 after the death of Henry Royce which is the owner of the said car brand. Actually, it was Henry himself who decided to change the colour of their badge because he realized that red can clash to some of their models’ colour. The first model that was released with a black badge was the Phantom III of 1934 and was also the first car without the input of Mr. Henry Royce. Just as well-known is the statue on the radiator grille, the Spirit of Ecstasy. In 1909 the statue was made by the English artist Charles Sykes, who was friends with Rolls and Royce. Actress and model Eleanor Thornton was the model. The Silver Wraith was the first post-war Rolls-Royce. 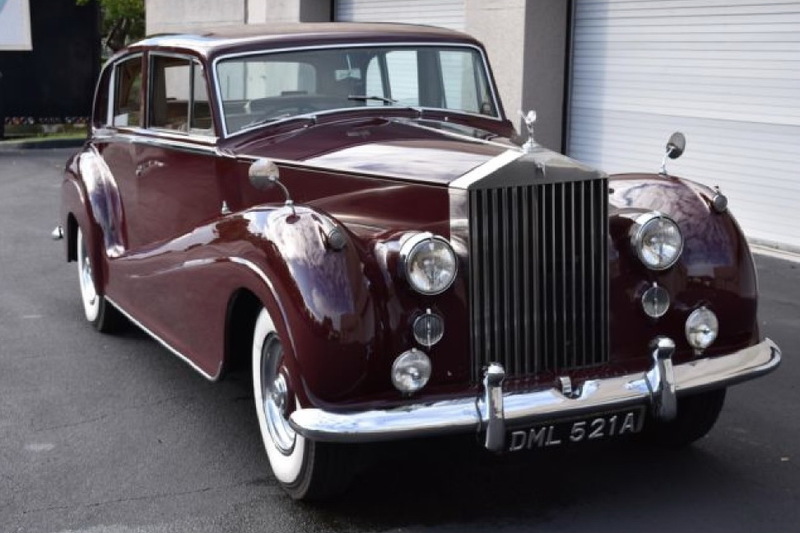 It was made from 1946 to 1958 as only a chassis at Rolls-Royce's former Merlin engine plant, their Crewe factory, alongside the shorter Bentley Mark VI. 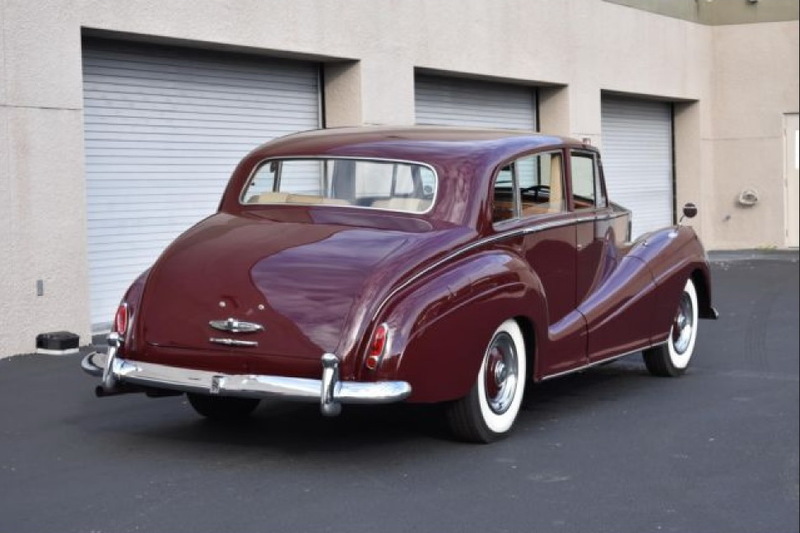 The Bentley too was available as a chassis for coachbuilders but also for the first time could be bought with a Rolls-Royce built standard steel body. 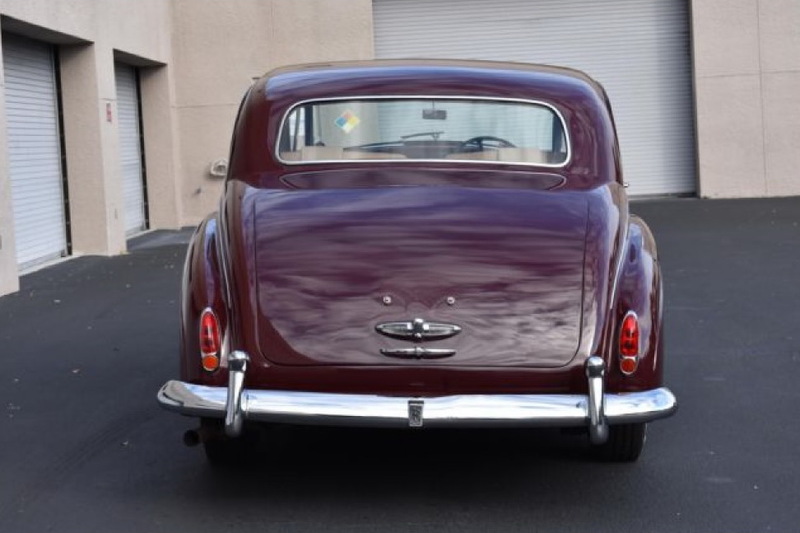 It was announced by Rolls-Royce in April 1946 as the 25/30 hp replacement for the 1939 Wraith in what had been their 20 hp and 20/25 hp market sector, that is to say Rolls-Royce's smaller car. The size was chosen to be in keeping with the mood of post-war austerity. 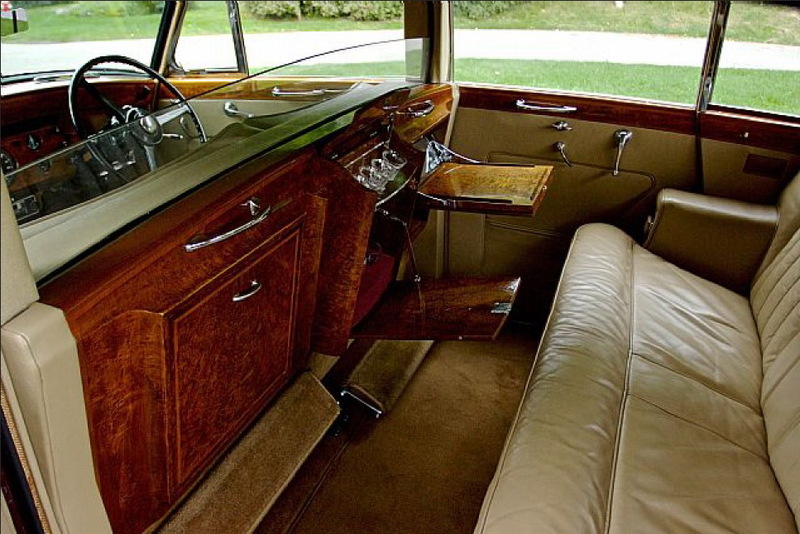 Even very limited production of the chassis of the larger car, the Phantom IV, was not resumed until 1950 and then, officially, only for Heads of State. Improvements announced were: chromium-plated cylinder bores for the engine; a new more rigid chassis frame to go with new independent front suspension; and a new synchromesh gearbox. Chassis lubrication was now centralised. March 1959. US advertisement Rolls-Royce Silver Cloud. Note the left handed steering wheel. RR logo and ornament Spirit of Ecstasy on the radiator. 1956. 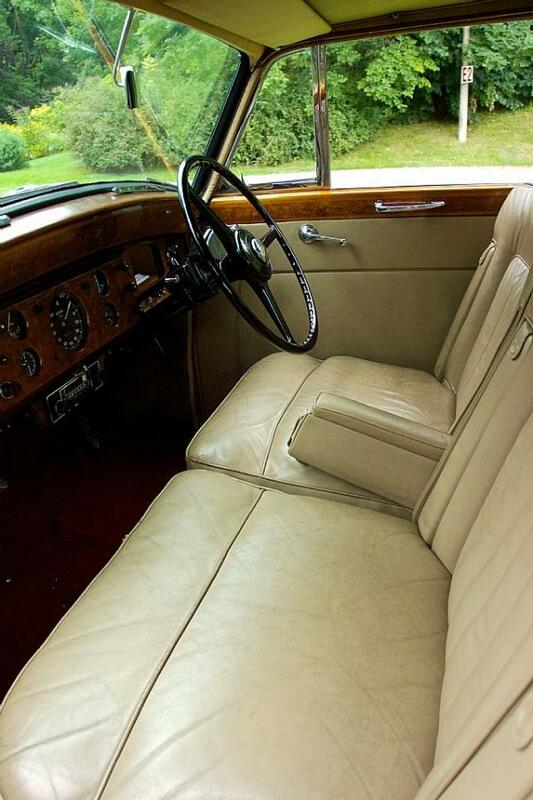 Rolls-Royce Silver Wraith Touring Saloon. The impressive front with the famous RR logo on the radiator grille and the Spirit of Ecstasy ornament. 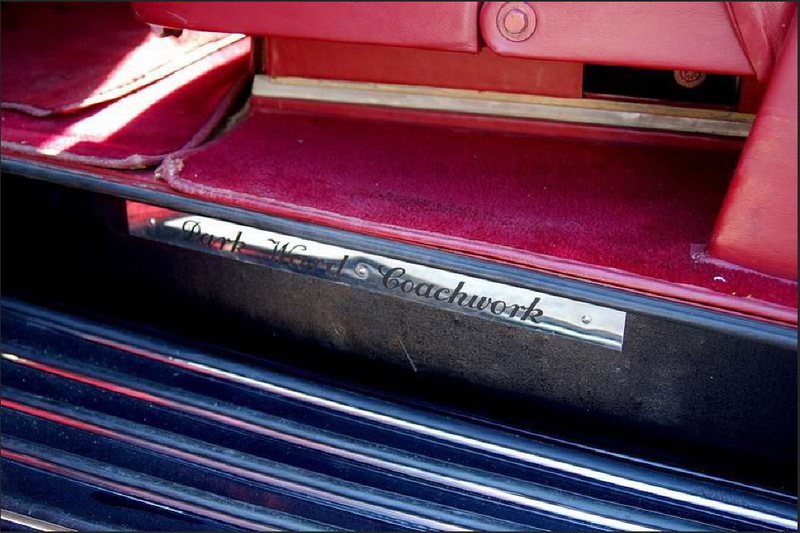 Brochure Park Ward Coachwork Rolls-Royce Silver Wraith. We all know that the rivets are a very important part of the base of the model. With this we can determine whether the base is still original and the rivets have not been changed to make any possible changes to the model. That’s why we always take special attention to the rivets of a model. 1) February 1959-1964. My DT 150 with the usual convex rivets with a hole in the middle. 2) February1959-1964. DT 150 with convex rivets without hole in the middle and slightly pointed. Apparently at a certain time type 2 rivets were used so that we can find a same model with a base plate with type 1 or type 2 rivets. There is a lot of information to be found about all kinds of wheels, tires and baseplates, but very little information to find about different types of rivets. As far as I could find, DTMM and GBDT does not talk about this. That's why I researched a number of baseplates of other post-war DT models from different production periods trying to find out the beginning of the use of type 2 rivets, but that is not so easy. No logic can be found in that. I concluded that type 1 and 2 rivets were very often used on a same model. It appears that first type 1 and after that type 2 rivets were used. The earliest model with type 2 rivets I could find is a green DT 157 Jaguar XK 120 Sports Coupe (1954-1962) with beige ridged hubs, knobbly tyres and red tail lights. The end flap of its box has a stamp 559, which means May 1959 and its box has a pencil price of 2/5, which was the price for the 157 Jaguar in the 1959 catalogue and price list. So this model is very accurate to be dated. You can find several of this 157 Jaguars with green colour on Ebay with type 1 and type 2 rivets. I also tried to find out when they possibly went over to use only type 2 rivets and I thought it could be 1962 because I myself have a 146 Ford Fairlane with a baseplate with type 2 rivets. The previous owner engraved April 1962 in the base plate. DT 146 was issued from January 1962, but I found also a 146 model with type 1 rivets and after April 1962 I still found models with type 1 and 2 rivets on the same model, such as 113 M.G.B. Sports car (October 1962-1969) and 147 Cadillac 62 (October 1962-1969). So both types rivets were used for a certain time and again no logic can be found in that. January 1962-1965. 148 Ford Fairlane with type 1 Rivets. Issued from January 1962. January 1962-1965. My 148 Ford Fairlane with type 2 rivets and engraved April 1962 on baseplate. But I think that at some point they switched to use only type 2 rivets, because we mainly find type 2 rivets on the later models. I base my thinking on model 258 Cadillac 62 USA police car (1966-68) below. I have looked at all the base plates that I could find of model 258 on Ebay , QDT and internet and they all had the type 2 rivets. But this is my own assumption and difficult to say with certainty, so opinions, corrections or additions are very welcome. 1966-68. Dinky Toys 258 USA Police Car Cadillac. I only found this model with type 2 rivets. 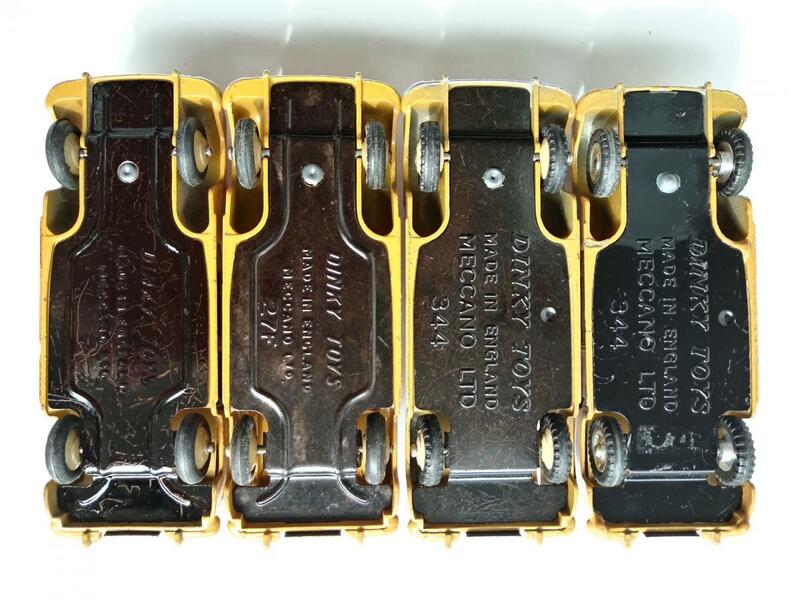 When I saw a base plate with these type 2 rivets for the first time, I doubted about the authenticity, but when I started looking for pictures of several same models, I was reassured. Nowadays it is easy to find pictures of all models on the internet, such as Ebay or QDT, for comparison. So in fact a third photo of a Dinky Toys with a base plate with genuine type 2 rivets had to be added in the catalogues. 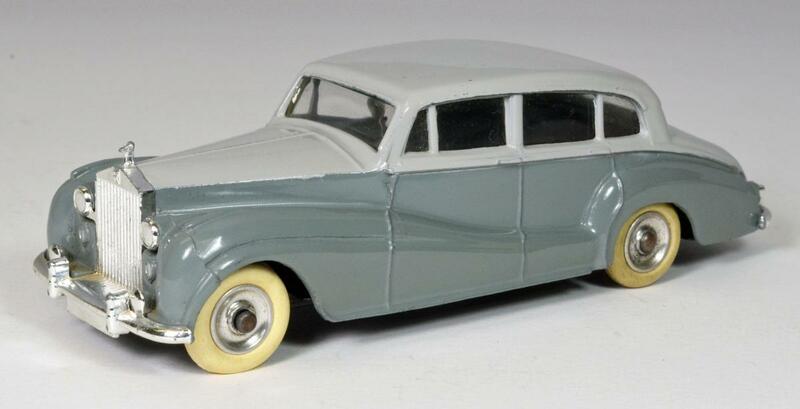 Dinky Toys 150 Rolls-Royce Silver Wraith exported to France. Around 1960 this DT 150 model was also exported to France in parts and assembled there by Meccano France with another base plate with sales number 551 and the text Assemble en France par Meccano, with its own French plain box 551. A 551 topic has already been opened for this British export model. I only add here the pictures of the 2 different base plates of the 551 with also type 1 and type 2 rivets as an addition to my research. 1959-60. DT 551 base plate with text Assemble en France par Meccano and type 1 rivets. 1959-60. My DT 551 base plate with text Assemble en France par Meccano and type 2 rivets. Sales brochure Rolls-Royce Silver Wraith with Coachwork by Park Ward. The drawing of Park Ward Coachwork of the Rolls-Royce Silver Wraith Touring Saloon. The DT 150 miniature exactly matches the lines of the Park Ward drawing. An accurate reproduction of this famous car. It was one of the most successful Dinky Toys produced by Meccano Liverpool. In France the model was sold out within 2 months and you had to wait half a year for a new one. 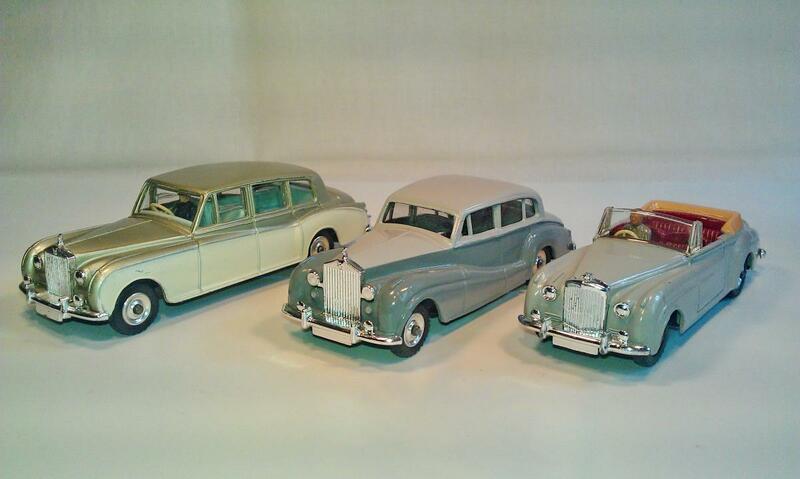 At the end I show pictures of my 3 Dinky Toys Rolls-Royce family and a real 1956 Rolls-Royce Silver Wraith Touring Saloon built by coachbuilder Park Ward. Very nice, comprehensive account, Jan. It must have been difficult for you to stop, even a rivets analysis included! Jan--A very nice writeup on this most famous car.....and very complete indeed. I always enjoy seeing vintage photos and copies of factory literature included, as well as the cars history. Dinky Toys made a splendid model of it, and the accuracy of their effort is easy to see. I bought my example new, when it was first announced, by orderimg directly from H. Hudson Dobson in 1959. I was a young boy of 14, so you can imagine my delight when it arrived......gleaming two-tone paint, real plating on bumpers and grill, and working suspension. The only thing I thought was not right was the use of those heavily treaded black tires. I had grown used to seeing so many of the French Dinky's arriving, looking so elegant with their polished wheels and white tires. So I quickly swapped out some extra smooth white tires, and put those treaded black tires on one of my Jeeps. I am including a photo of it below.....I have to apologize as those white tires are in need of cleaning! To me, this was far and away the nicest of the many new models that Meccano had Dinky introduce from 1958-1959. I did not care for many of the other new models that came out then....they had new, untraditional paint schemes, most came with those ugly, large, heavily treaded white tires, the baseplates were no longer the earlier mottled finish, but were now shiny black, and many of the new models didn't appear to be as accurate, and I even disliked the new windows. 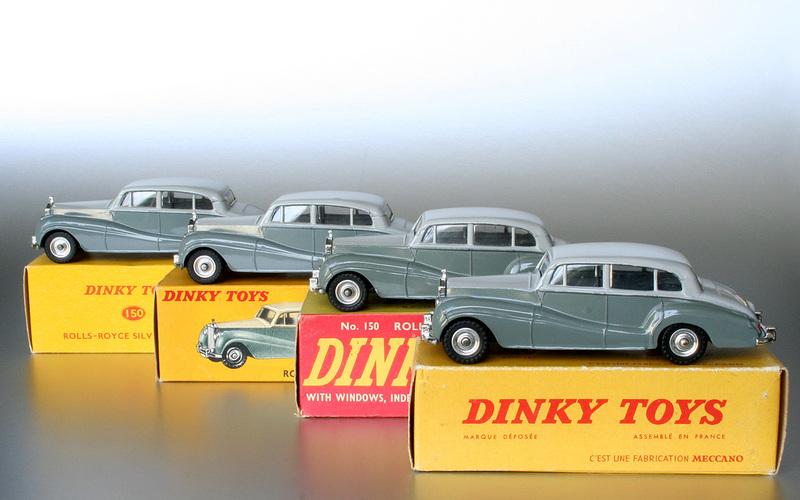 In fact, 1959-1960 marked the end of my first and earliest collecting phase of Dinky Toys. I was not happy with the new models, they were getting harder to find here in the US, and I was now in high school.....so I did not resume collecting until the mid-1970's. Jan and Terry. Thank you for your contribution. I add a photo of the base plates of my 4 variations of my Estate Cars 27f / 344 (1950-61), which clearly shows the development of the main base plates and the rivets. From left to right from small to large lettering. From mottled to glossy base plate and from type 1 to type 2 rivet on the last 344 with spun hubs. An other excellent write up from Jan.
Having a spread sheet of Dinky by date of issue, I have also made a study of the french rivets recently and from models in my collection I concluded that the change had been made around 1965. The last model with type 1 rivets seems to be the GAK Berliet réf. 589 issued in 1965. As at this time trere were no more monthly Meccano Magazines and one does not know the month of issue of this model and one can not be more accurate about the begining of the type 2 domed rivets. Of course some models issued before 1965 had type one rivets and further runs were made later with the type 2 rivets. There were certainly several riveting machines at the factory and their tools have certainly not been changed at the same time. This may have been done over a period of several months. All we can say is that in Bobigny the change started in 1965.